An integrin, or integrin receptor, is an integral membrane protein in the plasma membrane of cells. It plays a role in the attachment of a cell to the extracellular matrix (ECM) and to other cells, and in signal transduction from the ECM to the cell. There are many types of integrin, and many cells have multiple types on their surface. Integrins are of vital importance to all metazoans, from humans to sponges. 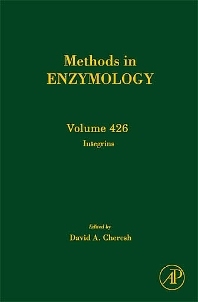 This volume in Methods in Enzymology presents methods for studying integrins. Biochemists and researchers in related life science fields.